Fourteen percent of all those enormous cranes that you see on building sites around the world are in Dubai. That is a true fact, at least according to our on board lecturer. She has inundated us with facts and figures about all the ports we have visited and so far a great deal of the information she has given us has been incorrect. 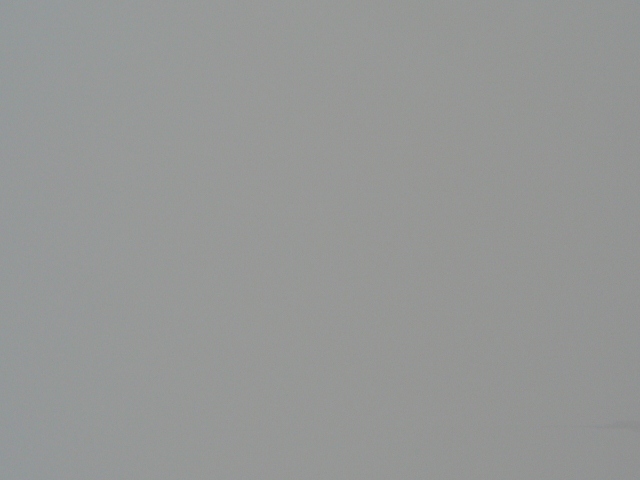 But when we see the Dubai skyline we have no reason to doubt her in this case. Dubai suffered terribly in the down turn of the world economy but there are signs everywhere of its speedy recovery. The place is a cross between Las Vegas and a giant building site. We are going to the Burj Al Arab Hotel (that’s the one that looks like a giant sailing ship) for tea. It was built a few years ago now and our on board lecturer tells us that it is the only seven star hotel in the world. That we soon learn is not correct. I think I should have her job. I can make stuff up as well as anyone, as witnessed by this blog. 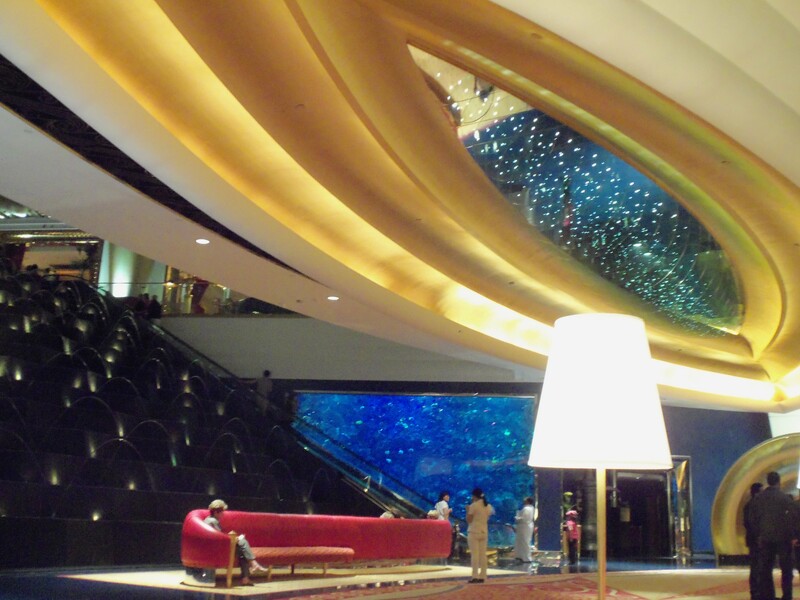 The Burj Al Arab is indeed a seven star hotel, but there is another one in nearby Abu Dhabi. You cannot just wander in to have a look. The only way to see the hotel is to actually stay there. If that is beyond your budget, and trust me it is, then you can make a dining reservation. And trust me again, this too is beyond your budget. We discover that the cheapest meal offered is Afternoon Tea. And for a paltry $125 per person including tax, but not including tip, you can have tea there. For that they throw in a glass of champagne. What a deal! Dear readers, many of you know that both Gordon and I have a weakness for bubbles so that does it for us. We are sold. How stupid are we? Answers are not required. We have learned that you can’t just walk in, you have to make a reservation, and reservations are hard to come by. We booked three months ago. The Hotel is several miles from the port . There are three ways to get there. You can take a taxi. You can take the “hop on, hop off “ bus for a mere $60 each for a day pass, or you can take the brand new mono rail for $3 each for a day pass. You do the math. What we save by taking the monorail pays for one of our teas. We are feeling so much better now. The monorail is amazing. It is fast, clean and easy to use, with announcements being made in English as well as Arabic. But that’s not the amazing part. You can travel across most of Dubai on the monorail and there are many stops. But all the stops are at either a shopping mall or a bank. Welcome to Dubai where even the public transport system recognises that the only reason to be there is to shop. And to shop you need money. Hence the stops: Shopping Mall, Bank, Bank, Shopping Mall, Bank. The Malls are huge with every designer store known to gay man, and believe me, we know a lot, in each one. There are a number of these malls, each with the same stores, so they have to have a gimmick to attract customers. 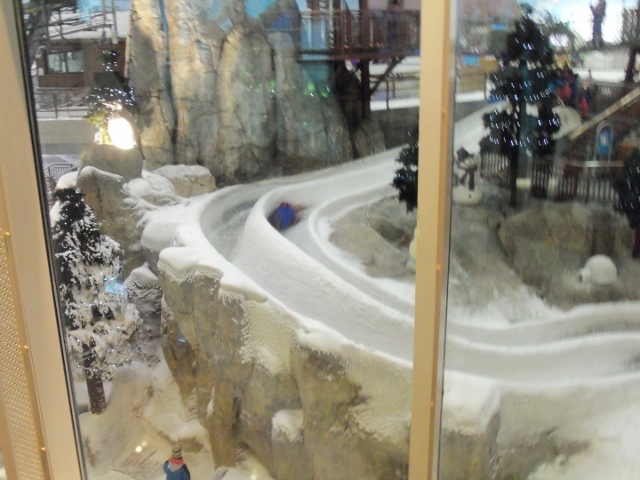 We stop at the Mall of the Emirates which has a winter wonderland as its gimmick. But this is no little Disney World type ride. This is a full size winter resort with snow all year round inside a giant dome structure. Most local residents have never seen snow. 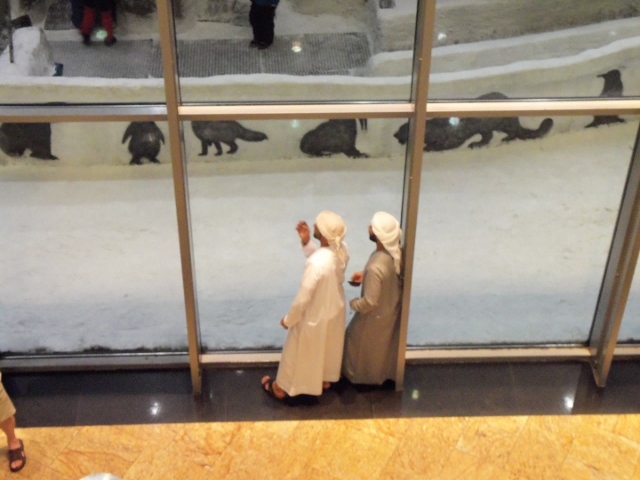 This is Dubai – they haven’t even been cold. From there we go to the hotel. Before they built the hotel they built a small island to put it on connected to the mainland by a causeway, so that no one except a good swimmer can sneak in unannounced. 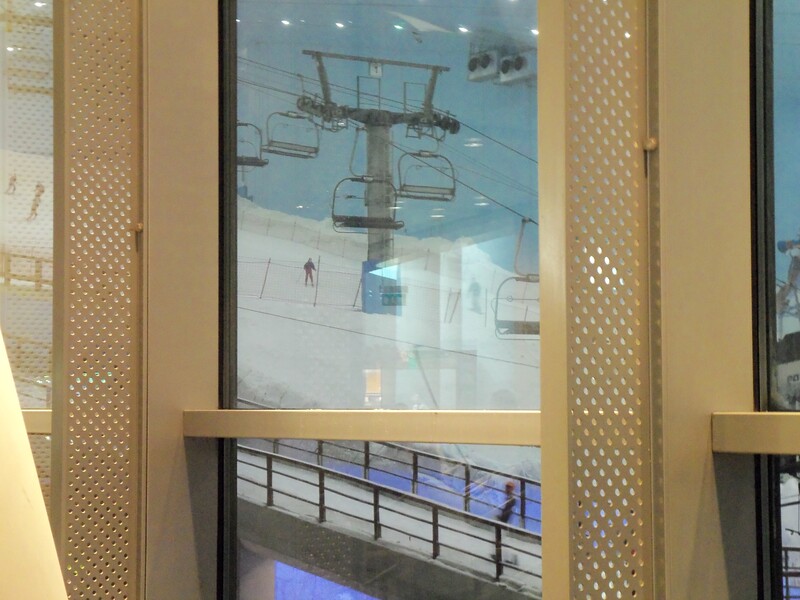 Just like “Ski Dubai” it is huge and over the top, (that is an aquarium going up the side of the escalator). The fabulosity meter final emerges again and makes a great deal of noise. 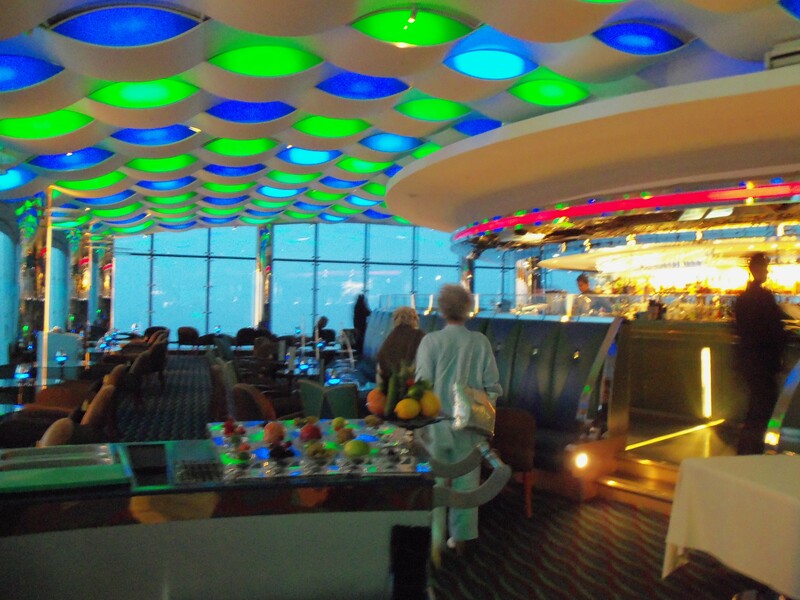 We have booked to have tea in the sky lounge – a restaurant at the very top of the hotel suspended out over the water with amazing views. It is reached by a glass elevator that appears to rise up out of the water . The fabulosity meter is still going strong. The first glass of champagne disappears alarmingly quickly. We are hoping if we are very nice to the waiter we might get a second glass. We try our best to charm him (you didn’t know I could be charming, did you) but it doesn’t work. He doesn’t know I can be charming either. 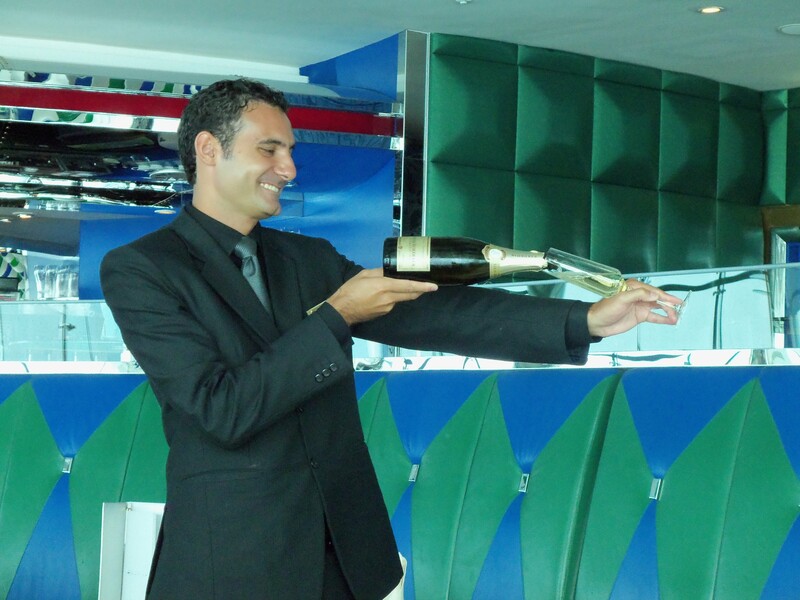 He is happy to pour us a second glass, but it will cost us another $35. 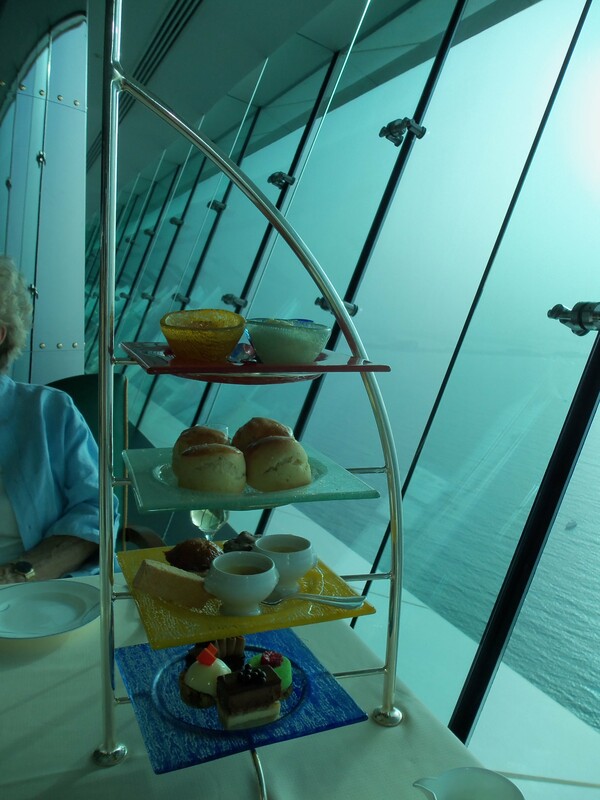 We would have to take several more trips on the mono rail to pay for that, so we move on to tea. No tea could possibly be worth $125 and this tea is no exception. However it is served on very stylish stands that mirror the shape of the hotel The tea may be nothing to write home about, but the service is. We are allowed to sit for as long as we want and we spend a very pleasant 3 hours there. We work out that it cost us $80 an hour to be there. But it was worth it. We felt fabulous. I have no idea what he is doing on the ship – but there he is. 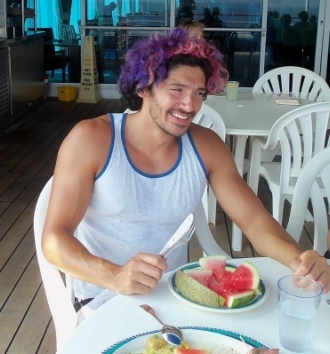 And that is not a wig. It is his hair. As the cruise progresses the color fades, but sadly never completely disappears. Nor does he. Well fabulous is as fabulous does.. i think your fabulosity meter might have exploded at such a height! So glad you made it for the tea, as I know I will never be there so once again living vicariously! Hey..Really nice touch with your informative words. It seems like expensive but yes now I can understand, sometime doesnt matter for trying this kind of royal experience. Thanks for sharing.